Polymer materials are used in different fields of industries, from microelectronice to medicine. Ion beam implantation is method of surface modification when surface properties must be significantly changed and bulk properties of material must be saved. Ion Beam Treatment of Polymers contains results of polymer investigations and techniques development in the field of polymer modification by high energy ion beams. This book is intended for specialists in polymer science who have interest to use an ion beam treatment for improvement of polymer properties, for specialists in physics who search a new application of ion beam and plasma equipment and also for students who look for future fields of high technology. Chapter 1-3 are devoted to overview of the basic processes at high energy ion penetration into solid target. The historical aspects and main physical aspects are covered. A basic equipment principles and main producers of equipment for ion beam treatment are considered. Chapter 4 contains chemical transformations in polymers during and after high energy ion penetration. The modern methods and results of experimental and theoretical investigation are described. 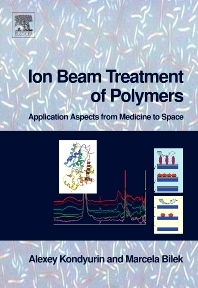 Chapters 5-10 are devoted to properties of polymers after ion beam treatment, regimes of treatment, available applications, in particular: increase of adhesion of polymers and a mechanism of an adhesion increase, wetting angle of polymer by water and its stability, adhesion of cells on polymer surface, drug release regulation from polymer coating and others. Chapter 11 contains our last results on polymerisation processes in liquid oligomer composition under high vacuum, plasma and ion beam conditions as simulation of free space environment. For universities, research centres, companies in the polymer industry and dealing with plasma and ion beam equipment.